Upper Hollowfields is a mixed farm with arable crops and cattle/sheep grazing the grassland areas. The hedgerow pattern contributes to the historic character of the site. Hedge management is considered carefully in each field, where possible complimenting other environmental work on the farm, for example higher, thicker hedges provide sheltered semi-shaded spots on 6m wildflower arable margins to benefit plants and wildlife suited to these conditions. 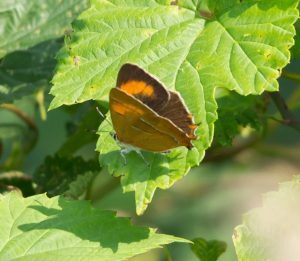 Our hedges are managed sympathetically to provide the best range of habitats for wildlife including the brown hairstreak butterfly, a variety of bird species and small mammals. We aim to preserve the historic landscape pattern, whilst maintaining hedges as physical barriers to help prevent flooding, wind erosion and pollution. 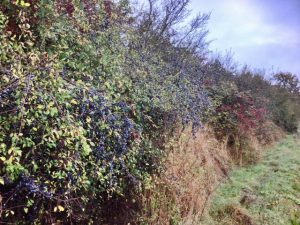 It is important that hedge management results in a plentiful berry crop as a food source for wildlife during the winter months and hedgerow trees are managed sensitively. We benefited from advice from Natural England on hedge options, and Butterfly Conservation guided our hedge cutting schedule to suit the brown hairstreak butterfly, the female of which lays eggs on young blackthorn shoots. They stressed the importance of blackthorn coppicing and 3 to 5 yearly cutting rotation for this rare species. Birds have been recorded through the RSPB Volunteer & Farmer Alliance Scheme. 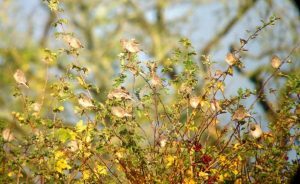 Our RSPB volunteer has continued to monitor the birds pointing out the significance of established hedges for yellowhammers, lesser and common whitethroat, chiffchaff and willow warbler all of which breed on the farm. Hedges have been sympathetically managed to provide a variety of hedge heights to benefit the varying needs of birds species, e.g. hedges over 4m tall for bullfinches compared to 1.5m for whitethroats. Blackthorn suckers have been allowed to grow along field edges to provide young shoots for the brown hairstreak butterfly. Hedges have been coppiced to regenerate the hedges natural cycle of growth. Thinner hedges have been replanted with native species including blackthorn. Hedges have been cut on rotation, sometimes only cut on one side to allow maximum benefits for wildlife with many cut once in 3 years. Cutting takes place at the end of the winter season to allow a generous berry crop to benefit wildlife. During one very dry summer, new hedge plants failed and had to be replanted. Extreme wet weather conditions on another occasion made hedge cutting difficult, so some hedges were cut a year later. Cutting on a 3 year cycle made hedges more difficult to cut, so we sought the use of a hedge cutting contractor with equipment appropriate to deal with larger hedges providing excellent results. We will continue to monitor wildlife on the farm and allow results to dictate the work, seeking further specialist advice on other species and adapting the work accordingly. We have found the total hedge cutting cost for one hedge to be roughly the same, if the hedge is cut once a year or once every three years. The benefits are stronger, thicker and denser hedges with new growth where coppiced. They provide good shelter for stock, a windbreak for crops and compliment our other agri-environment scheme options. The success is obvious and measurable. West Midlands Butterfly Conservation have recorded over 400 brown hairstreak eggs on hedges to the east of the farm this winter. 82 species of birds have been recorded by our RSPB volunteer. 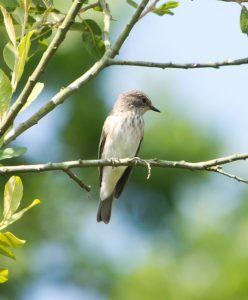 For many of these such as the bullfinch, linnet, song thrush and spotted flycatcher hedgerows are a primary habitat. Berry crops are plentiful due to this management, providing a valuable food source for wildlife. During extreme wet periods, hedges can be seen to contain flooding. – Assess your own farm environment and choose management options that fit with your farming pattern and benefit species relevant to your situation. – Don’t hesitate to seek expert advice from organisations such as the RSPB and Butterfly Conservation to give in-depth understanding of management techniques and their benefits relevant to your farm. – Choose good quality hedge plants and pay attention to details such as mulching and using rabbit guards when planting.